What a Week for the Great Lakes (and every one of us that depends upon them)! After working on Great Lakes protection and restoration issues for the past 15 years, it’s hard for me to think of a time when so many accomplishments occurred in such a short period of time. That said, last week was good week—actually, a great week. Especially when you consider that much of the work that went into these accomplishments started well over a decade ago. It’s what I’d consider winning the triple crown of Great Lakes restoration. Here’s what was accomplished late last week… Plan 2014 for Lake Ontario and the St. Lawrence River Enacted! After fifty years of regulation that forced unnatural water levels and flows on Lake Ontario and the St. Lawrence River—devastating the health of the ecosystem and degrading tens of thousands of acres of wetlands—the U.S and Canadian governments recently seized a once-in-a-generation opportunity to restore the health of the lake and river by enacting “Plan 2014.” Plan 2014 is a modern, balanced water level management plan that will work with nature to restore the health of the lake and river, while continuing over 50 years of shoreline protection. The plan will restore 64,000 acres of wetlands, which is largest wetlands restoration effort in U.S. history outside of the Florida Everglades! If that wasn’t enough, the plan will also rebound populations of fish and wildlife such as the Northern Pike and Black Tern, provide a $5.3 million annual increase in hydroelectric power production, provide a $12 million annual increase in recreational activity along the St. Lawrence River and Lake Ontario, and continue over 50 years of significant shoreline protection. And one more thing—the cost of implementing Plan 2014: $0. We have to thank the 25,000+ of our members that signed petitions and wrote letters in support of Plan 2014 in the last couple years, which contributed to the 36,000 expressions of support that we—along with our coalition partners—delivered to the White House Council on Environmental Quality in D.C. this fall. We couldn’t have done it without your support! Great Lakes Restoration Initiative Act passed! We often tout the importance and success of the Great Lakes Restoration Initiative (GLRI), which has provided well over $2 billion since 2010 to fund over 3,000 restoration projects throughout the Great Lakes. The GLRI has ushered progress in cleaning up toxic hot spots, fighting invasive species, restoring critical habitat, and so much more; yet we still have a lot more restoration work to do. While the GLRI was funded in each federal budget since 2010, the program has never been authorized by Congress. Without an authorization, the GLRI could be at risk from changing administrative and congressional priorities. Authorizing the program provides greater long term certainty for restoration to continue, and allows more long-term, complex restoration work to move forward. After advocating for an authorization since the program started several years ago, the GLRI Act was finally passed as part of the Water Infrastructure Improvements for the Nation (WIIN) Act (formerly known as the Water Resources Development Act) with bipartisan support from Congress last week! The law authorizes the GLRI for $1.5 billion over the next five years! Great Lakes Restoration Initiative funding continues! As previously mentioned, the GLRI has provided well over $2 billion for more than 3,000 restoration projects since 2010. The GLRI has been biggest boon to Great Lakes restoration in decades, helping to push forward long-awaited projects, such as the cleanup of the Buffalo River. The GLRI has provided over $100 million for 229 projects in New York State alone. The success of the program has been dependent upon Congress continuing to fund the GLRI year after year, in order to ensure progress continues and previous investments are not wasted. The Continuing Resolution (CR) passed by Congress last week continued funding for the GLRI at current funding levels through April of 2017, ensuring that progress to protect and restore the lakes can continue! We certainly couldn’t have accomplished this without a multitude of partner organizations, which have been with us every step of the way. And very importantly, this success has been dependent upon strong and enduring support from the public. Our members have signed petitions, written letters, spoken at public hearings, and even traveled to Albany and Washington. We thank you! As we take time to celebrate these victories for the Great Lakes, we also recognize that our work is never done, and the New Year will certainly bring new challenges. Although as we’ve seen time and time again, with strong support from you—the public—there is nothing we can’t accomplish. We look forward to working with you to continue to advance Great Lakes restoration in 2017! How to Avoid Plastic Microbeads: Ban Them! Ever since I heard about Dr. Sherri Mason’s research on plastic microbeads in the Great Lakes, I’ve become very concerned, some say obsessed, with the issue of microbeads. The fixation began in my own house, where I found toothpastes, facial scrubs, and hand soaps with microbeads. My wife and I threw them all away, and vowed never to allow one of these products in our house again. Within almost no time at all, we failed. On a couple of occasions, microbeads deviously snuck their way into our home. We won a gift basket with liquid hand soaps that contained microbeads. I quickly noticed what it was and chucked it. After a dentist appointment for my daughters, the “goodie” bag they brought home had toothpaste with microbeads. An odd choice for a dentist, since the beads are being found lodged in gums and cavities, posing a potential threat for infection. Regardless, we threw them out, educated the dentist, and moved on. The most recent invasion of microbeads into my home was today. My wife was at the store with my daughters shopping for a number of things, including toothpaste. They were out of the natural stuff that we usually buy and the kids think is gross, so our girls were excited to get something else this time. 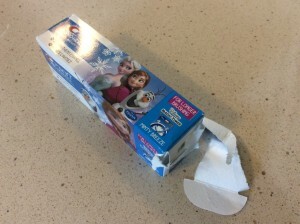 They quickly noticed a box of “Frozen” toothpaste. Put Anna and Elsa on anything, even something without sugar, and my kids will want to buy it. So it was a no-brainer; they had found what they wanted and threw it in the basket. Aside from just sharing my personal failures and telling everyone I made my four-year-old cry today, I mention these stories for a reason. As someone that has worked on this issue for two years, doing countless hours of research, writing fact sheets, and advocating for policies to ban plastic microbeads, I consider myself somewhat educated on this issue. Yet, microbeads have made their way into my home. Being an educated consumer is extremely important, but it is not enough to solve the problem of plastic microbead pollution once and for all. For that, we need a legislative ban. Legislation to ban plastic microbeads in personal care products passed the New York Assembly with near unanimous support in April. The same bill has been introduced in the Senate, and now has 37 cosponsors. Only 32 votes are needed for the bill to pass, making this a sure-thing if Senate leadership allows a vote. As of now, there are only a few days left before the end of the legislative session. Help us get this critical, no-brainer legislation over the finish line by emailing legislative leaders and demanding a vote before session comes to an end. More than 40 years ago, President Nixon signed the Controlled Substances Act into law, which essentially provided the public with two options for their unused drugs: surrender them to law enforcement or dispose of them yourself. Even pharmacies, which dispense significant amounts of pharmaceutical drugs, are prohibited from taking unused drugs back without law enforcement present. Therefore, the best option for safe disposal has been take-back days held by the DEA and local law enforcement. In the past four years, these events have removed 4.1 million pounds of prescription medications from circulation in the US. CCE supports these events and encourage the public to participate. However, given the sheer amount of pharmaceutical drugs out there, these events don't even scratch the surface of the problem. Take-back days only occur a couple of times per year, and are inaccessible to many people. While some police precincts are also housing permanent drop boxes for unused drugs, safe disposal remains inaccessible to many. The result: drugs are stockpiled in medicine cabinets, drugs are abused, or they are flushed. This gets me to the point of why an environmental organization is so concerned about pharmaceutical drugs. For decades, the recommendation by the Environmental Protection Agency (EPA) and others was to flush your unused drugs, despite the fact that sewage treatment plants, septic systems, and drinking water infrastructure were never designed to remove these contaminants. While flushing is no longer recommended, it remains a common disposal practice by many residents and in many hospitals and long-term care facilities. Scientific studies are now demonstrating that all of this flushing of drugs is polluting our waterways. National studies have found trace amounts of pharmaceutical drugs in drinking water supplies of 41 million Americans. A study conducted by the USGS found low levels of drugs such as antibiotics, hormones, contraceptives and steroids in 80% of the rivers and streams tested. Throughout New York State and Connecticut, water sources have tested positive for trace amounts of heart medicines, antibiotics, estrogen, mood stabilizers, tranquilizers, and more. The effects of constant, low-level exposure of various pharmaceuticals on humans are uncertain, and more research is needed. Possible health concerns include hormone disruption, antibiotic resistance, and synergistic effects. While the health effects on humans have not yet been proven, pharmaceutical drug contamination has been proven to adversely impact fish and aquatic life. For example, studies have shown male fish have been feminized (produced eggs) when exposed to hormones (birth control pills). Other drugs, such as anti-depressants and beta-blockers, reduce fertility or affect spawning in certain aquatic organisms. With the growing epidemic of prescription drug abuse and the environmental impact of flushing, Congress recognized the need to provide the public with greater access to safe disposal options for their unused or expired drugs. The Secure and Responsible Drug Disposal Act of 2010 was passed into law to encourage voluntary drug take-back programs, beyond just take back days held with law enforcement. The law required the DEA to develop implementing regulations, which didn't happen overnight. CCE, along with leaders such as Senator Schumer, worked for years to urge the DEA to move forward with their regulations. Finally, after four years, just this week the DEA announced that they had finalized their regulations, which will go into effect in October of 2014. Release of the long-awaited regulations is a game changer -- the biggest step yet to provide the public with greater access to safe disposal options. The biggest barrier to safe disposal of pharmaceutical drugs by the public has been a lack of access to safe disposal options. The new regulations help to overcome this barrier by allowing pharmacies to finally take back unused pharmaceutical drugs--whether it be a secure lock-box at the pharmacy or the option to mail back unused drugs in an envelope. What could be easier than allowing the public to return drugs to the very same place that they get them--right in their neighborhood pharmacy? Pharmacies at hospitals and heath care facilities will also be able to take back unused drugs. This is critical since many health care facilities, which obviously have a large amount of pharmaceuticals on site, still flush controlled substances as a common disposal practice. As we celebrate the release of these regulations, we are reminded that our work is never done. While the regulations allow pharmacies to take back unused drugs, it is merely voluntary. We must ensure that pharmacies step up and provide this critical public service to our communities. While CCE will be reaching out to pharmacies directly, we also need your help. Next time you stop in to your local pharmacy, encourage them to participate and provide pharmaceutical take-back for its customers. We can keep dangerous prescription drugs out of the hands of abusers and out of our waterways with easy, safe disposal options!